Un fresco vestito multicolore e un bel drink dissetante sono proprio quello che ci vuole per affrontare queste calde calde calde serate estive. Io stasera ho proprio voglia di un bel Martini Royale...e mi viene in mente un look che si adatterebbe a pennello. Vuoi provare a fartelo a casa? qui puoi trovare la ricetta. Buon venerdì sera a tutte!!! 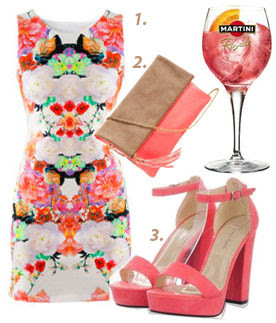 A colorful dress and a cool drink is all we need to have fun in this hot summer night...here's a look inspired by Martini Royale. Like it? Have a funny friday night!! Ok...I left you one week to collect and gather new ideas for a new post but...nothing happened!!! So this is the time for encouragement from one of the most faithful followers of this blog! C'mon BB, give us some news!! Great look and nice blog!